After five years volunteering as Editor of McIlvainea, I am stepping down. McIlvainea has a new Editor: Willow Nero. Willow is the newsletter editor for the Mycological Association of Washington's quarterly Potomac Sporophore. She first became interested in mycology in 2011 when she read Micheal Pollan's The Omnivore's Dilemma, which recommended hopeful foragers join their local mycological associations. After a few forays with MAW, she was hooked and happily exploring the more scientific aspects of mycology. Professionally, Nero works as a magazine editor at an association nonprofit. When I began, I was asked about the mission for McIlvainea and for a long time have not had a very complete answer. With this issue of McIlvainea, I can finally elaborate a multi-pronged role for our journal. In addition to our traditional role of publishing the annual toxicology report and the foray species lists, McIlvainea should support citizen science so that our members can effectively assist in the creation of a North American mycoflora. This means publication of articles about how to study fungi as well as publication of articles about studies that our members and others are conducting, species that our members and others have discovered. We should also use McIlvainea as a platform to publish the scientific talks given at the annual NAMA Foray/Meeting so that all members can benefit, not just those who were able to make it to a specific talk at the foray. Finally, we should use McIlvainea to help students develop skills in communicating with the public and the annual meeting as a place to give students a chance to present their work, while interacting with our members and the professional mycologists in attendance. I am announcing what I hope will become an annual contest giving awards for the best student paper submitted to McIlvainea (by January 15 of each year). There will be three categories: best paper by a K-12 student, best undergraduate paper, and best graduate/postdoc paper. There will be one additional judge’s option award. If no entries are received in any category, additional awards will be made in other categories up to four awards. Winners will receive $250 upon publication of their paper in McIlvainea, a one- year membership in NAMA, and an invitation to speak at a student symposium at the NAMA meeting. Student speakers at the NAMA meeting will receive $500 honorarium. To see select back issues of McIlvainea in our traditional format, follow this link. For 2014, I have invited previous student winners of the NAMA Memorial Fellowship and other graduate students to write papers for McIlvainea and to present at the 2014 NAMA meeting at Camp Arnold near Mount Rainier, Washington. Four have accepted. Their papers will be appearing soon in McIlvainea. Most students and mycologists who gave talks at the 2013 Shepard of the Ozarks NAMA meeting in Arkansas have papers finished or in preparation for this issue of McIlvainea. Morchella sp. (Mel-19), Gifford Pinchot National Forest, Washington. © Photo by Michael Beug. I am excited about seeing a revitalized McIlvainea. It has also been exciting year for me. Ascomycete Fungi of North America, my first book (with coauthors Alan and Arleen Bessette), has been released (University of Texas Press, 2014). In the past 12 months, I have found an unnamed species of Tuber, an unnamed Amanita, an unnamed Morchella, and at least a dozen unnamed oak-associated species of Cortinarius. 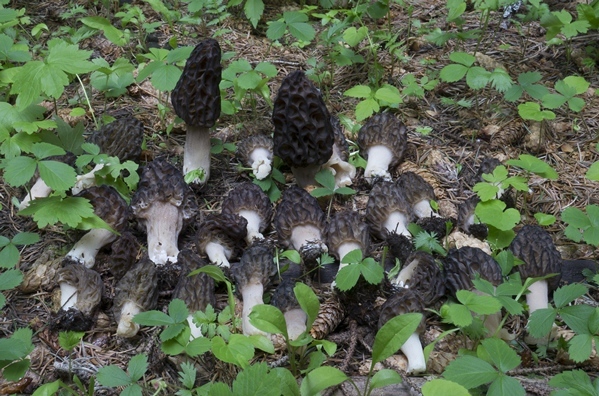 The morel is particularly exciting because most morels are highly localized and this species (Mel-19) had been found only in China and Europe. Coincidentally, Andrus Voitk submitted samples from Newfoundland and Labrador and I submitted a sample from Washington State to Kerry O’Donnell. We have a publication in progress. Cover Photo: New Sarcomyxa species, Husum, WA. © Photo by Michael Beug. The mystery mushroom on the cover of this issue was found growing on an oak stump (Quercus garryana) by a friend, Joe Zimmer, as we searched for Cortinarius species. I widely circulated pictures and no one had ever seen anything like it. Paul Stamets got it into cultivation. David Arora came to see it in the woods and we both thought that the coloration was similar to the late oyster mushroom, Panellus serotinus. Scott Redhead used DNA (and my observation of amyloid spores) to place it in Sarcomyxa, a close relative of Sarcomyxa serotina (synonym Panellus serotinus). I wanted to know if it was edible. Since Sarcomyxa serotina is non-toxic and the only other known close relative of my mystery mushroom is a choice edible Chinese species, Panellus edulis, I decided to try a sample. That is the only way to tell for sure. My wife was none too pleased and declined to try any herself, but science must progress. When the first small primordia formed, I had accidentally broken a couple off (about 1 tablespoon full). I started to throw them away. Instead, I sautéed them in avocado oil until lightly browned. They were delicious! I immediately hiked miles into the woods behind my house and all was good (fortunately). Two weeks passed and the mushrooms in the kits Paul Stamets had sent me had grown nicely. This morning I decided that it was time to eat a larger sample. I sautéed about ¼ cup full of sliced mushrooms in avocado oil (a very mild, very healthy oil), salted them lightly and took a nice big forkful. As I chewed them carefully, my tongue slowly went numb and the flavor, which at first was good, took on a bitter over-tone. I ran to the sink to spit it out! 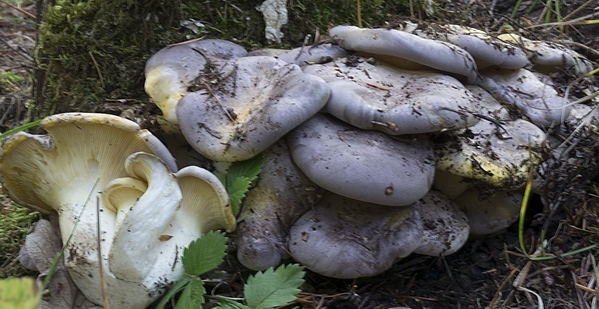 My dreams of a new, choice edible, cultivatable mushroom were dashed! Maybe Paul will uncover some interesting chemical properties. Like a Cantharellus, it stays looking prime and keeps on growing for weeks, resisting all of the decay organisms eager to break it down. Unlike a Cantharellus, it is easy to cultivate. McIlvainea accepts articles throughout the year. If you have an idea for a paper or are willing to review articles submitted for publication, I would love to hear from you. Instructions for authors can be found on the NAMA website. Submissions are reviewed. Once accepted, articles are promptly published online. Send manuscripts to Willow Nero, 1603 Key Blvd., Arlington, VA 22209; or by email to willownero [at] gmail.com.